Welcoming guests to Put the World on Your Plate, Agnes Ngulube Holmes quoted Jimmy Carter. 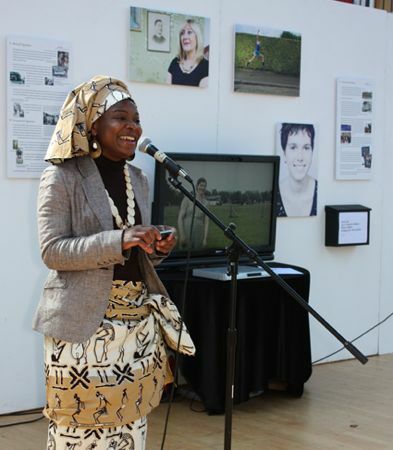 The words were a tribute to the great diversity around her at Sunday’s multicultural event when World Kitchen in Leith served up a fusion of foods inspired by the pictures and stories in Jock Tamson’s Bairns exhibition. This is not your stereotypical view of Scotland’s capital city. 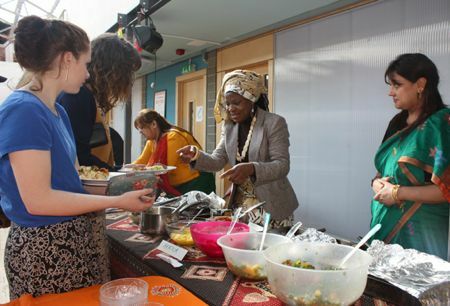 Song and sunshine were also on the menu as Agnes just happens to be both chair of World Kitchen in Leith and a founding member of Zawadi Alba women’s choir. Outside, the air had a definite Leith chill. Inside, the airy space of Out of the Blue Drill Hall there was African warmth – though that is a little hard to believe today with snow in the north, roads cut off, houses without power… and sleet in Edinburgh. But World Kitchen will be bringing summer back to Out of the Blue with tonight’s Italian Picnic. This time the event is inspired by the old film of Scottish-Italian picnics which were such great social events in Edinburgh and Glasgow during the 1930s-50s. Both of these events are set in the context of Jock Tamson’s Bairns, a fantastic exhibition of stories and pictures celebrating the contribution migrant cultures make to life in Scotland. And not least of all to Leith. In her speech of welcome Agnes paid tribute to the great community spirit of Out of the Blue Drill Hall. Then she outlined the strong links between Jock Tamson’s Bairns, World Kitchen in Leith and Zawadi Alba. 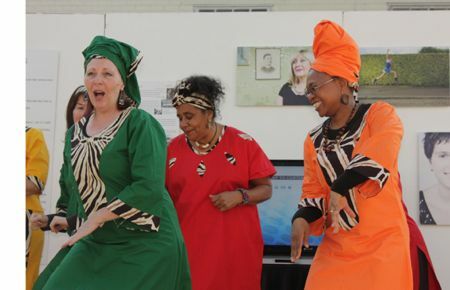 In different ways – through music, food, pictures and storytelling – each of these multicultural projects celebrates the great wealth of cultural diversity that makes Scotland a much richer and more interesting place to live in. Perhaps not altogether surprisingly, each one has been created by the determination and passion of talented volunteers. Which is why World Kitchen, Leith Open Space and Out of the Blue are all part of a fundraising effort to help develop the fantastic collection of stories and pictures. When you are visiting the exhibition – and you really should not miss it – look for the donations box. Even the smallest donation will help to grow the collection as an educational resource for schools and community groups across Scotland. As the box says, “We are all Jock Tamson’s Bairns”. 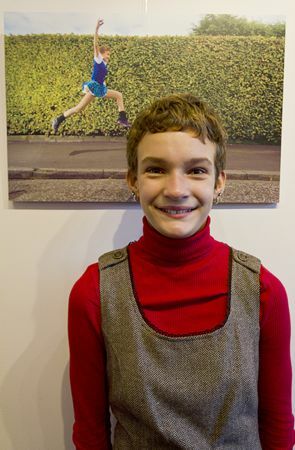 Jock Tamson’s Bairns, curated by Clara Massie and first thought of by Ian Harrower, director of Previously, Scottish History Festival, is open to the public at OUt of the Blue Drill Hall until 9 April. [Photographs of the World Kitchen and Zawadi Alba by Clara Massie].